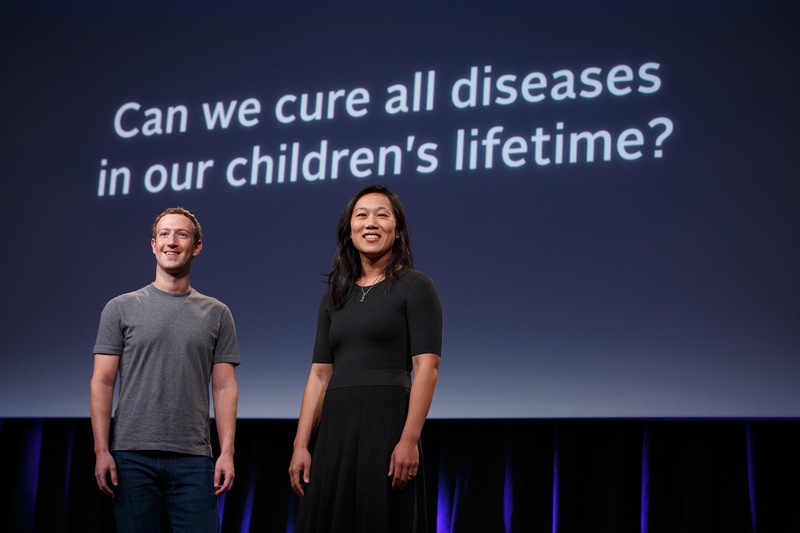 Facebook founder Mark Zuckerberg and his pediatrician wife Priscilla Chan have today pledged $4 billion to fight all disease, through the couple's philanthropic group. Last year, they said they would give 99 per cent of their Facebook shares to charitable causes - and today, well... they started to put their money where their mouth is. Called the 'Chan Zuckerberg Initiative', the limited liability corporation means Zuckerberg and Chan will put their Facebook shares over the next decade toward preventing, curing or managing all diseases by the end of the century. The goal is to "work together to cure, prevent or manage all disease within our children's lifetime," Dr. Chan said during the event in San Francisco for the Chan Zuckerberg Initiative. Dr. Chan spoke through tears as she recalled telling parents their child had an incurable disease or could not be revived. These experiences, she said, made her even more determined to work with scientists and engineers to build new tools that can save lives by the end of the century. Zuckerberg, who took the stage after his wife's speech, said he and Chan want to "make a better future for our children." How VERY cool is that?